Chicken arroz caldo is a type of Filipino rice porridge with chicken slices. It is best served when topped with hard boiled eggs, some chopped scallions, and toasted or roasted garlic. I personally like to squeeze a piece of calamansi or lime over the toppings. It makes the dish taste fresher and delicious. This chicken arroz caldo version makes use of glutinous rice (or malagkit). It is the variety of rice that is frequently used to make rice cakes or kakanin such as biko and suman. The previous arroz caldo recipe that I shared is almost the same, except that it asks for regular white rice such as Jasmine. I find it nice to add kasubha to chicken arroz caldo to give it a yellowish color. However, this ingredient does not influence the taste of the dish. If you want your arroz caldo to have a yellowish color while tasting even better, add Spanish saffron instead. I tried it several times and it always works like a charm. I can have Chicken arroz caldo anytime of the day, especially when the weather is chilly. The best time that I like to have a bowl of it is during breakfast. I usually have this early in the morning with a couple of boiled eggs and lots of roasted garlic. To me, it is a good meal to start my day. 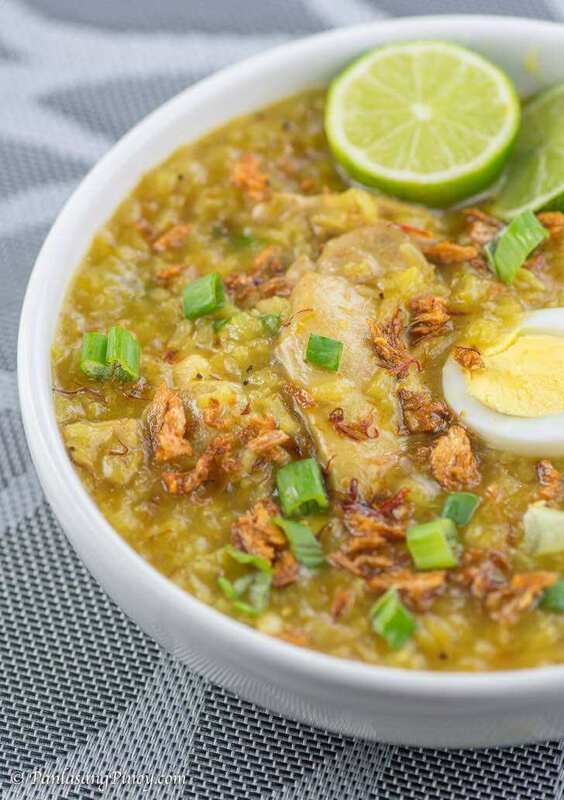 Try this Chicken Arroz Caldo Recipe. Let me know what you think. Heat oil in a deep cooking pot. Once the onion gets soft, add the chicken. Saute for 2 to 3 minutes. Add the glutinous rice. Cook for 1 minute. Add the chicken cube. Stir. Cover and cook in medium heat until the rice absorbs the water and the texture becomes porridge-like. Note: Stir the mixture once in a while concentrating on the bottom of the pan to make sure that the rice do not stick. You can add more water if needed. Add ground black pepper, fish sauce, and kasubha. Stir and cook for 3 minutes. Transfer to a serving bowl. Top with scallions, boiled eggs, and roasted garlic. Serve with calamansi or lime. Can I use saffron instead of safflower? do they have the same taste? yes! Definitely! I use saffron all of the time! Hi. I have a question po. I saw a small restaurant here in Abu Dhabi with the same name and logo like yours ikaw po ba ang owner non! I made this recipe today and it was delicious! 🙂 Thank you! More power. I’ve always been a fan. 1st time to comment but has been a reader and a follower for years! More power!!! God bless you!